All porcelain crowns, also referred to as all ceramic crowns, are the ideal solution towards a brand new life changing smile. Gone are the days of crowns with a black line or shadow at the gumline or a tooth so white it looks like a chiclet! We have extensive experience in our Orange, CT office in using cosmetic solutions like these to change your front teeth forever. This patient from Woodbridge, CT had old broken silver filings. Crowns were needed. All ceramic crowns were chosen because of their life-like qualities. Photos and case by Dr. Nicholas Calcaterra. The patient above got rave reviews from her friends in Woodbridge, CT when they saw her new smile. 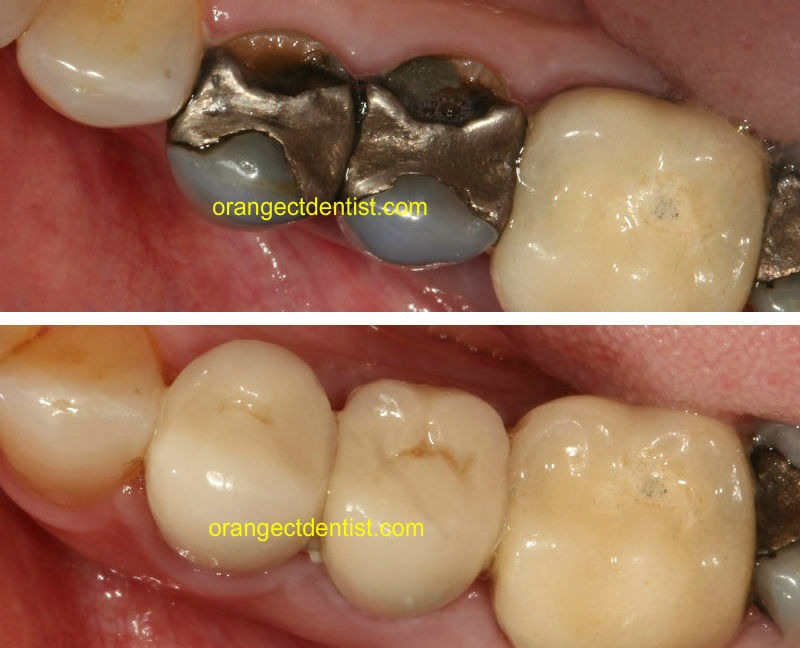 Gone are the dark and grey colors associated with the old silver amalgam fillings! Before and after. Dentistry and Photos by Dr. Nicholas Calcaterra. Clicking on the image will show you a larger version! The case to the right is on a patient from Milford, CT. As a teenager, he was playing hockey and was hit in the front teeth with a hockey stick. The teeth were nearly dislodged but his childhood dentist was able to save them. He lived like this for nearly 30 years and would never smile! He was embarrassed and self conscious about his yellow and brown teeth. He would often avoid certain social situations because of his teeth. You can see what he looked like when he initially came to our office in the photo to the right. 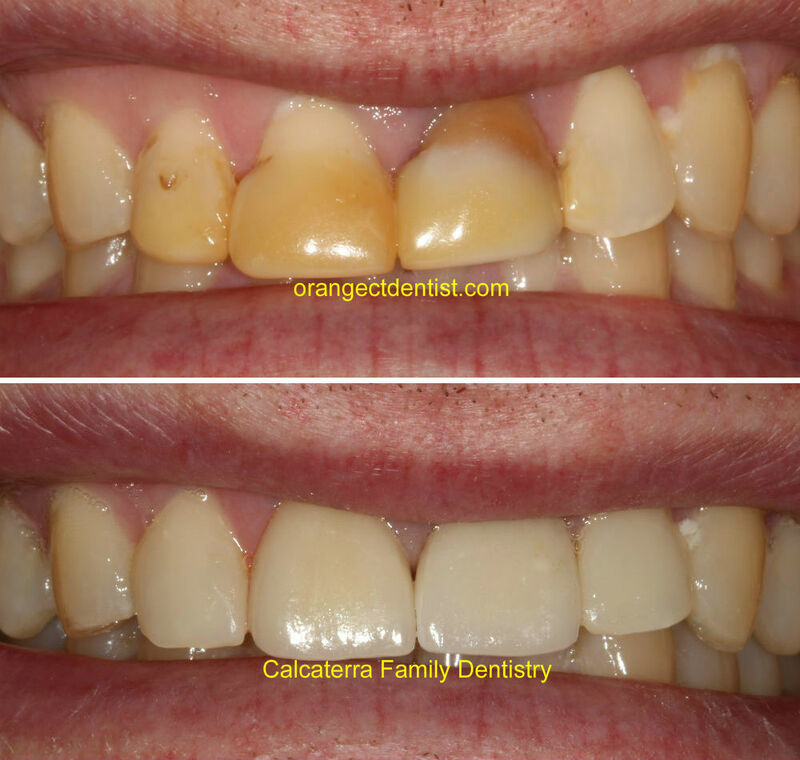 He worked closely with Dr. Nicholas Calcaterra and they proceeded with 4 all ceramic crowns. We think the results speak for themselves. He left the office a changed person and now smiles all the time! This may sound like a cliche but this was a life changing moment for him! If any of the above seems familiar, we can help! This patient from New Haven, CT came to us to correct her smile. No metal underneath which can lead to a black line or shadow at the gumline. Lifelike translucency that looks just like natural tooth enamel using various shades of the porcelain. Strong and durable – the porcelain will not chip off the metal underneath because there is no metal underneath. Biocompatible – no potential for allergic reactions to nickel or other metals used in porcelain-metal crowns. 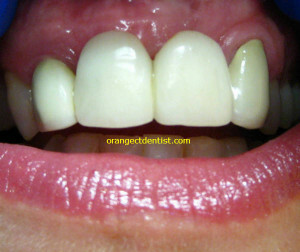 All porcelain crowns can give a similar result to porcelain veneers. Visit this page to learn about porcelain veneers. Call us today or go to our appointment page to schedule a consultation.